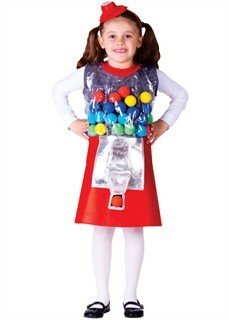 This Kids Gumball Machine Costume will have your child looking sweeter than ever! The perfect outfit for any kid who has a sweet tooth. This gumball outfit includes gumball dress and matching headpiece. Please Note: This item runs small. If your child is between sizes please order the next size up. Availability: The Kids Gumball Machine Costume ships in approximately 1 business day. T2 Toddler 2 1-2 Yrs 33"-36" 24"-26"
T4 Toddler 4 2-3 Yrs 36"-39" 26"-28"
Small 4-6 4-6 Yrs 39"-45" 28"-30"
Large 12-14 12-14 Yrs 50"-57" 34"-38"
Extra-Large 16-18 14 Yrs + 60" + 35"-43"